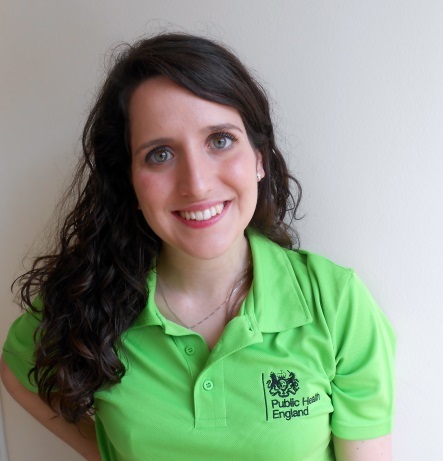 PhD student Raquel Medialdea Carrera has just returned from Makeni, Sierre Leone where she spent five weeks volunteering at a Public Health England Ebola Treatment Centre. Here she tells us all about her experience. Almost a year and a half since the first case of Ebola in West Africa and this lethal virus has taken the lives of more than 11,000 people and infected almost 27,500. However, over the last few months the number of Ebola deaths has been decreasing. May 2015 saw the lowest number of new cases since the beginning of the outbreak with less than 100 new cases in Guinea and Sierra Leone reported. Local efforts, together with an extensive international collaboration, have managed to bring the spread of Ebola under control. For five weeks during April and May this year, I volunteered to work in a diagnostic unit at an Ebola Treatment Centre in one of the most affected areas of Sierra Leone. Being able to help during the worst Ebola outbreak in history has been one of the most fulfilling and rewarding experiences I have ever had. One of my colleagues wearing the full personal protective equipment in the Red Zone of the Ebola Treatment Centre. Working in the centre represented an intense and challenging task. We had to deal with oppressive heat (sometimes the temperature in the laboratory was over 37ºC! ), stressful high containment work, strict protocols, the continuous use of irritant disinfectants that impregnated every inch of our skin and wearing special personal protective equipment (PPE). Working in the diagnostic unit was an enormous pressure as we knew that every single blood tube or swab sample we were cautiously handling could contain thousands of Ebola viruses that could potentially infect any of us if a problem with our PPE or the protocol occurred. However, our pre-deployment training by Public Health England was excellent, the facilities were surprisingly well-equipped and my colleagues were splendid professionals; all of which made the extensive working hours feel enjoyable and rewarding. In addition, the local and international workers who helped run the centre did an incredible job and made it a privilege to be part of such a good team. A key moment during my time at the centre was witnessing the number of new Ebola cases reduce to zero in our district. I was also there when last Ebola survivors from our centre were released. After that, the workload was still immense as new suspected patients continued to arrive every day. Moreover, we were analysing between 20 and 80 samples daily from individuals who had died in the community in order to confirm that the cause of death was not Ebola. 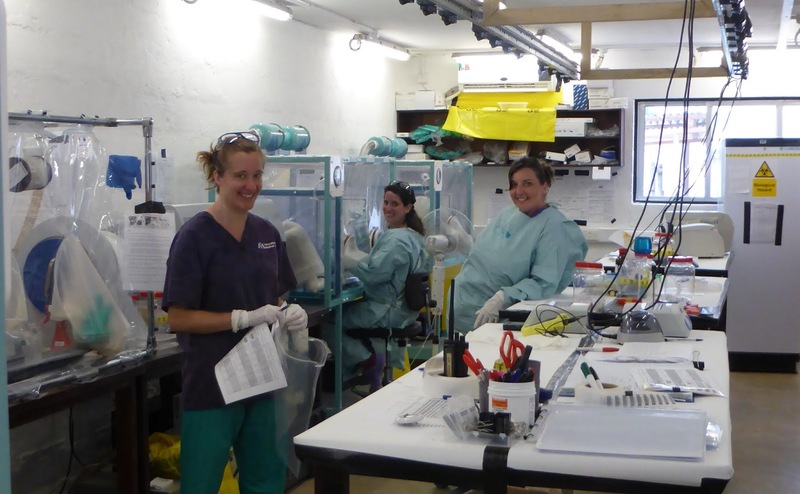 The diagnosis of Ebola is based on a “simple” qPCR test - What might seem like a straightforward procedure in our laboratories here in Liverpool was a complex task with added dimensions in a high containment laboratory in Sierra Leone. During my deployment I had the chance to witness a wide range of unique experiences. For example, every time an Ebola patient was recovered in our treatment centre, an enormous joyful celebration took place. All the workers would join together dancing and singing with the survivor who was then considered a hero. 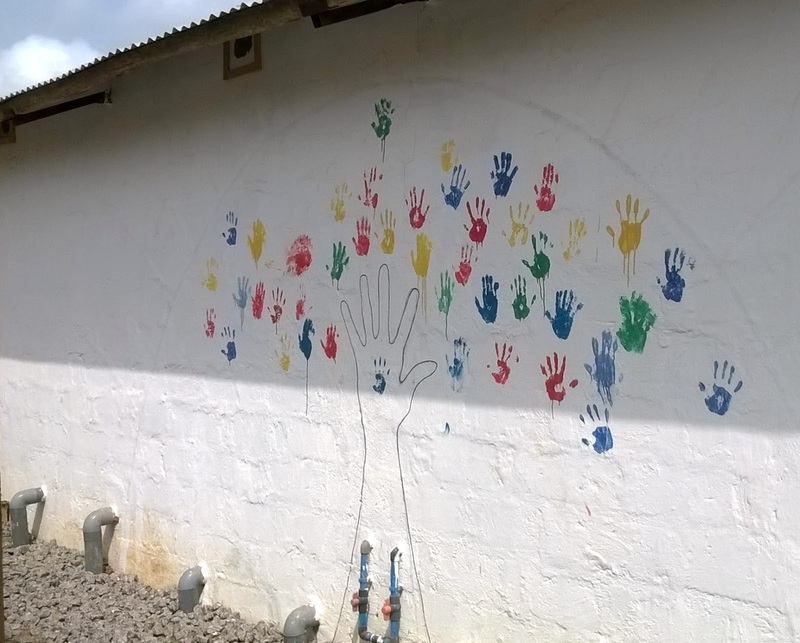 Survivors also left a brightly coloured hand print on a wall at the centre as part of the celebrations. On some of my days off, I helped the Centre's group of psychologists (the psychosocial team). This team were in charge of the psychological support given to the Ebola patients, as well as to their families. 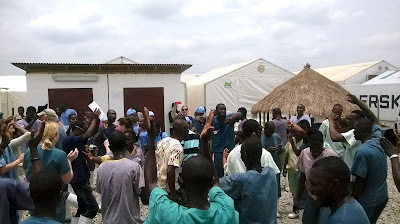 Every survivor that leaves the hospital receives a diploma certifying that they are free of Ebola together with new clothes and hygiene products. This is because most of their clothes and belongings would have been burnt to avoid the spread of Ebola. The psychosocial team was also in charge of the wellbeing of the survivors and assisting them in cases of family rejection or post-infection sequelae. Many survivors have had psychological conditions and stress, and additional physical symptoms such as headaches, fatigue, vision impairment and joint pain. 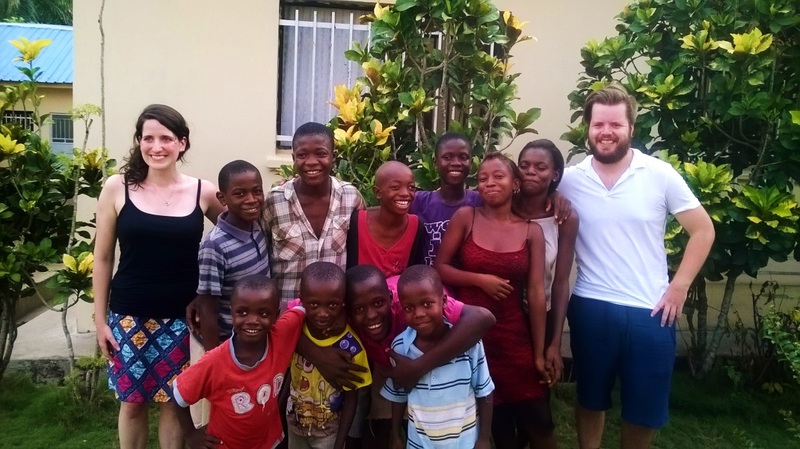 Visiting the SOS orphanage in Makeni was another incredible experience. 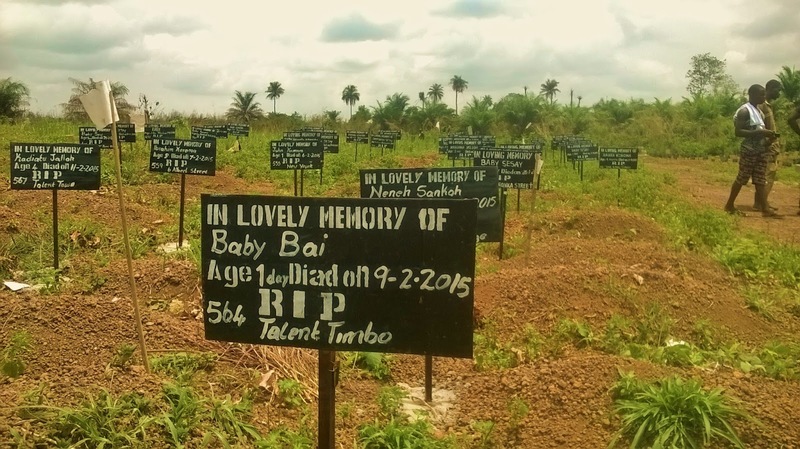 Children have been among the most vulnerable population group during the outbreak. Orphans and child survivors had faced abandonment and stigmatisation in their communities. In this orphanage they embraced child Ebola survivors who had lost all their family. They gave them the opportunity to grow up as part of a family in a joyful, loving environment. I also visited some schools but was very disappointed to discover that a teacher in Sierra Leone only earns around £35 per month and has 60 to 120 pupils per class. For more than 8 months schools were closed as a measure to control the spread of Ebola. UNICEF estimates that this has affected more than 5 million children in West Africa and that many have not been able to return due to lack of resources in their families. 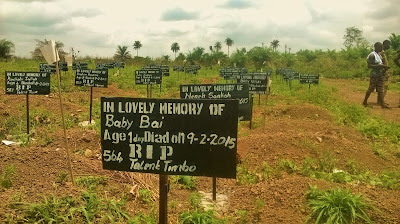 One of the most shocking experiences was visiting the cemetery for Ebola victims in my town, Makeni. I could only describe it as an immense disheartening field crammed with graves. There were no gravestones, only some succinct insignias saying the name and age of the deceased. During my period volunteering in Sierra Leone I had thousands of really good experiences. However, some other were not that pleasant. For example, six days after my arrival I started developing fever (more than 39°C), headache, joint pain, fatigue… all the symptoms of many common infections in West Africa - including Ebola! The doctors decided to isolate me in a room and I was in strict quarantine as a precaution to avoid putting anyone else at risk. Even the doctors would not enter my room and would leave the medicines by my door. Luckily, the first symptoms appeared after only a few days in West Africa and the chances of my illness of being Ebola were very low (as the incubation period is on average 8 days). Finally, on the fourth day, the fever dropped down and I recovered very quickly. It is very hard to summarise so many experiences in just a few paragraphs, but if you are considering helping in a health humanitarian crisis, I would strongly encourage you. It gave me an amazing opportunity to learn and embrace an incredible culture. Sierra Leone is a beautiful country and the locals were all respectful, brilliant and cheerful people. Indeed, even though my mission there was to help the local efforts, I feel they have thanked me much more with their gratitude, hospitality, hope and positivity. Hopefully, this incredible local and international collaborative effort will put an end to the worst humanitarian health crisis in recent history. The reduction in the number of new Ebola cases is very encouraging, however, we cannot stop being vigilant until we reach zero. Undoubtedly, we need to keep doing research, keep supporting the survivors, keep following all the contacts of every new Ebola case and help rebuild a society that has been impoverished and decimated. We need to keep fighting against Ebola until every country in West Africa has been declared Ebola Free. Raquel Medialdea Carrera is an MRes-PhD Student in the NIHR Health Protection Research Unit in Emerging and Zoonotic Infections at the Institute of Infection and Global Health.